When I think I’ve seen everything in the Berkshires of Massachusetts, there are still new discoveries to be made. Why am I drawn back to the Berkshires? Is it the magical landscape, the history, the literary legacy of Hawthorne, Melville and Wharton, or the ghosts of people and memories that seem to inhabit every branch, leaf and stone? 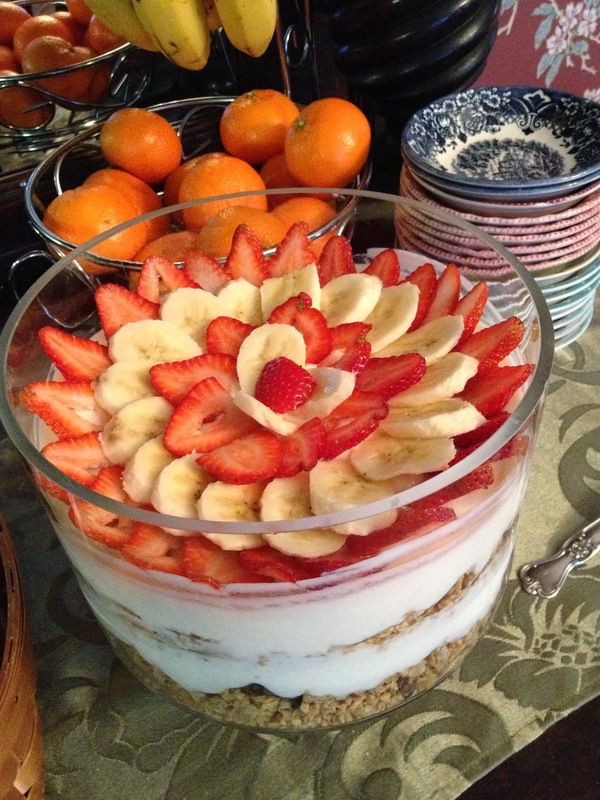 Certainly, it is the breakfasts, and the welcoming family at the Rookwood Inn in Lenox. I’ve made an annual autumn visit there for nearly 18 years. 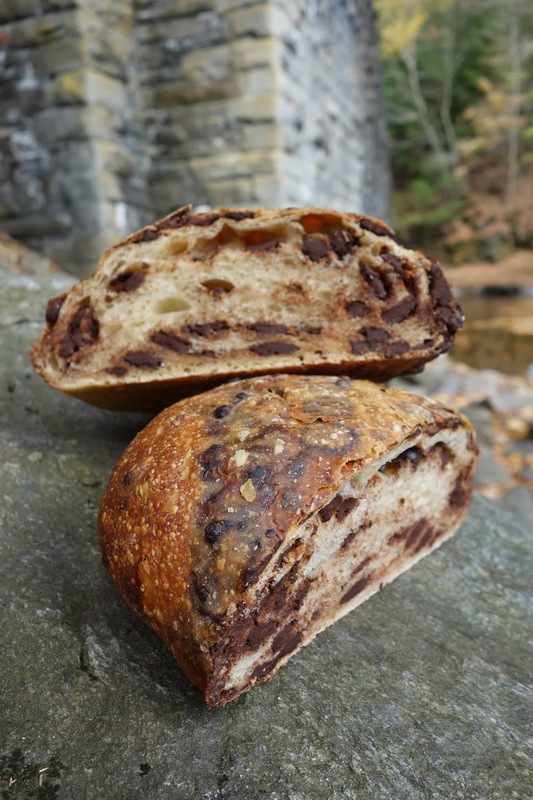 After breakfast at the Rookwood, there is usually little need of daily bread, but I’ve recently learned of the Berkshire Mountain Bakery in nearby Housatonic. One of their signature loaves is known simply as “Bread and Chocolate.” How can I resist a pilgrimage? I make the drive past the glittering Stockbridge Bowl, framed by fiery autumn leaves. 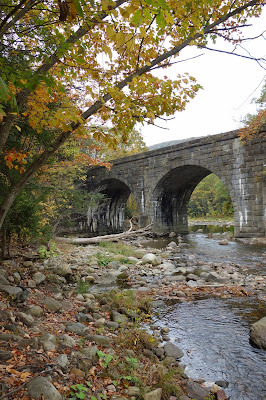 For whatever reason, I’ve spent very little time in Housatonic during my visits to the Berkshires. Like everything in the Berkshires, it is just moments away. The Berkshire Mountain Bakery is a large brick structure that sits on the banks of the Housatonic River and was founded by Richard Bourdon in 1986. The bakery practices the ancient art of natural sourdough bread baking and Bourdon studied fermentation in Holland, where he headed one of the first bakeries there to revive the craft. The Berkshire Mountain Bakery now offers this ancient ingenuity daily in the form of delicious artisanal breads. It is a stunning autumn morning. The early sunlight filters through the bakery window, illuminating mounds of rustic loaves. I make my purchase, tuck the loaf of Bread and Chocolate into my backpack and head for my next destination. The perfect round loaf, studded with chunks of chocolate will be the ideal lunchtime repast. 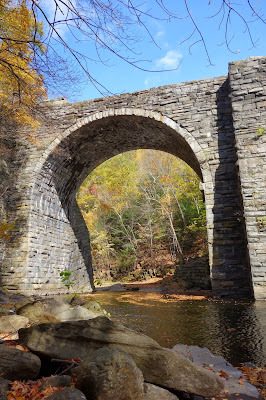 I drive some 30 minutes to the trailhead of the Keystone Arches Bridge Trail, near the small town of Chester, Massachusetts. The hike follows the Westfield River and the path of the Western Railroad, built in the 1830s. Major George Washington Whistler, who was the painter Whistler’s father, surveyed the steep area. While not immortalized like Whistler’s Mother, the Major was involved in some extraordinary accomplishments. 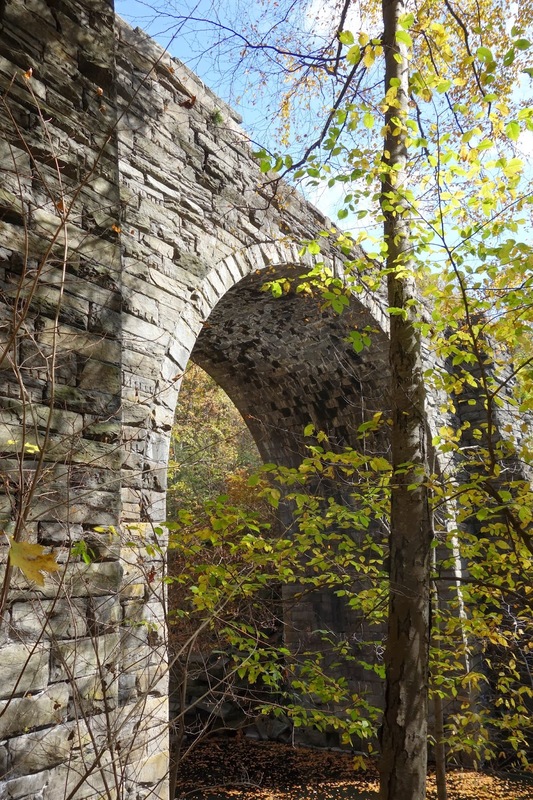 In its day, the Western Railroad was the longest and highest railroad in the world. 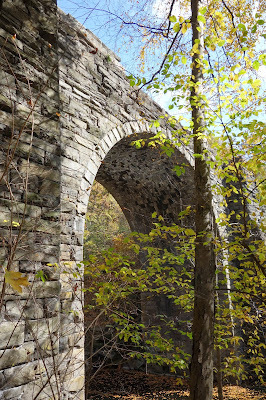 The series of Keystone Arch Bridges that supported the now abandoned route, are accessible by foot, and are a monument of manmade engineering and natural elements. After an hour or so of walking, I reach the most spectacular Keystone Arch and carefully make my way down to the river to observe its grandeur. 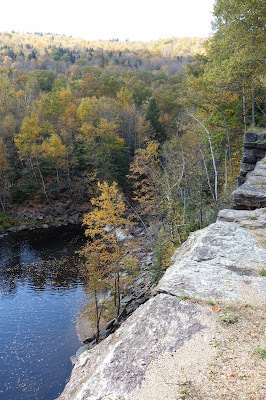 Seated on a rock by the side of the river, I pull the Bread and Chocolate from my pack and eat chunks by hand, watching the autumn leaves swirl on the water near my feet. The bread is sturdy, significant and decadently delicious, much like the magnificent structure that stands before me. Bread and Chocolate and the Keystone Arches – ingenuity at its finest. Many predicted it would happen, but I didn’t believe it. Now, I realize I should have seen it coming. I am now canning everything. Then, I started shopping in order to can. I would scour the farmers market for anything that might look good in a jar. The Peach Preserves were silky, and the Cinnamon Pear Jam heavenly. 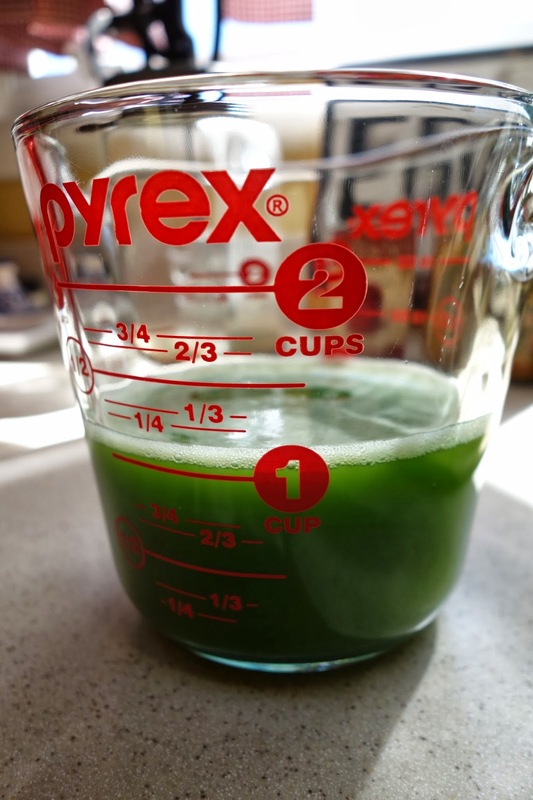 A fresh herb jelly using basil and parsley from my own garden was perhaps the zenith of sustainability. But, green peppers and guilt did me in. Restoration Farm has produced a bumper crop of bell peppers, jalapeños and other specialty peppers this season. I kept staring at that mountain of peppers. Guilt is a huge emotion when you’re a member of a CSA. I could not let one more green pepper rot in the crisper. So, I reached for the canning cookbook. Green pepper jelly looks like something served for brunch in the wonderful Land of Oz. A heap of bell peppers are pulverized along with two jalapeños in the food processor. Then, you let the pepper juice strain from the puree, and cook the juice along with sugar, vinegar and pectin. The interim color is a bit muddy, but a couple of drops of green food coloring perk it right up. The result is a sweet and savory jam with just a touch of warmth from the jalapeño. Guilt averted. I’m thinking a little green pepper jelly with a bagel and cream cheese will really jump start breakfast. The head grower at Restoration Farm, Caroline Fanning was very understanding when I confessed my obsession to her. “Hold the phone,” she said. “Have you made chutney? If you haven’t made chutney, you haven’t canned everything.” She’s very kind, but I can see the writing on the wall. A short while back, I met another obsessive canner at a community dinner. Heather was perfectly charming, but all the signs were there. She let drop that she owns a pressure canner and several people at the dinner were raving about her Carrot Cake Jam. She actually sells her preserves at the farmers market. The subtext was clear. Boiling-water canning is for amateurs. Pressure canning is the big time. Heather casually mentioned, with a tempting gleam in her eye, that this is a good time of year to buy a pressure canner because they are often on sale. Well, I don’t need much encouragement to make a purchase. I’ve already started comparison-shopping. No doubt canning my own tuna – and a whole lot of therapy – is in my future. It’s been some time since we’ve heard from my pal Zany. Who would have guessed she was singularly responsible for upping the calorie intake of the city of Chicago? Greetings from the Windy City. I’m writing to you from the finish line. No, I didn’t run a race…but I did go on a bit of a baking marathon over the past few months. For this, I blame you, as I often do when it comes to over-ordering and other spontaneous food adventures. It all started last year after I read a Culinary Types post about the love of your bundt pan. After reading that entry I said to myself, “I don’t have a bundt pan…should I get one?” And later that morning I waddled (you may recall last winter I was pretty pregnant) to my nearest Macy’s and purchased my very own pan. I remember making my first bundt just a day later for a ladies lunch at my friend’s house in the burbs. For my first recipe I used your recommendation to go with a Martha Stewart classic – the blueberry lemon bundt. “Maybe something like a ‘summer of the bundt’,” I suggested. “I could do a different recipe each month!” The carb lovers rejoiced. A few weeks later I followed up a pound cake with lemon-basil frosting from Cooking Light. I try to balance the number of calories I bring into the office, so considering the two sticks of butter I used the last time, this was my nod to a little lighter eating. The pound cake was nice and solid, and the frosting had a light flavoring – perfect to pair with an afternoon cup of tea. I alerted the boss that another bundt was on the premises, but this time he kept an arm’s length. The next bundt was in celebration of my good friend and colleague Jonesy’s birthday. Jonesy has an adventurous spirit, which is what I really like about her. She also got extra points in my book when she agreed to visit a food truck for a lunch meeting (note to loyal CT readers, we ate outside). For her, I went the old school route and made Betty Crocker’s sour cream coffee cake. T.W., this cake is why people call things “classic.” It was crumbly like coffee cake should be, the cinnamon swirls were my finest piece of art…and the frosting….well just look at the picture! Now I was in a groove. My bundts were falling perfectly from the nonstick pan and I was earning water cooler street creds in the office. Bringing that cake into work was a grave mistake. Colleagues DT and Brecks both labeled it as the best thing I had made since I started working there. Now I was in trouble. Summer wasn’t over and I still had more bundts to make! T.W., you may recall my panic attack one weekend as I struggled with which recipe to choose next. We decided on a white chocolate raspberry bundt, because if you can’t beat a chocolate recipe, serve another! Despite your warning about your experience with overloading / exploding berry bundts, I added a few more raspberries to this recipe – and it was worth it! As summer drew to a close, I had the perfect bundt finale in mind. But a certain Chicago-based carnivore, who shall remain nameless, decided to vacate the city for weeks, so she wasn’t around for me to bake her a birthday bundt surprise! I searched and searched for the perfect recipe, asking Sticky Hands for advice. And as I fed her a scoop of homemade applesauce it came to me…why not honor the coming of a new season?! Despite the 80-degree Chicago weather, last weekend I lined up my nutmeg, cloves and cinnamon to welcome autumn with an apple spice bundt and maple frosting. Again, I read the recipe to assistant Sticky Hands…who was more interested in the cooking tools than the actual cooking. So, now you know what I did this summer. But, as my colleagues reminded me, there are three other seasons in a year, so why stop now?! When last we left my colleague and BFF Amanda, I had bid her farewell on the subway, as she returned to Queens with some 12 dozen homemade Twinkies and Ding Dongs under her arm. After that, I went to Oregon – without her. She went to Germany – without me. And, then we came to the conclusion that it had been weeks since we’d seen each other, so we booked a lunch date. 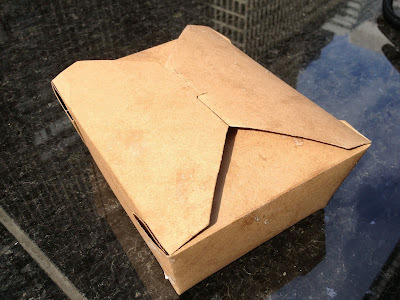 Truth be told, Amanda actually cancelled a lunch date with someone else to have lunch with me. I was honored and I have no idea who she blew off, or what excuse she gave. We decide that a little food trucking is in order. It’s our very first food truck date and it’s my job to get a fix on our options. After a frustration morning learning that none of the “greats” are in the neighborhood (am I EVER going to have a meal at the Mac Truck?) I get a hot lead on a sidewalk cart that’s been around for about a year, but is new to me – MTBLLS NYC. 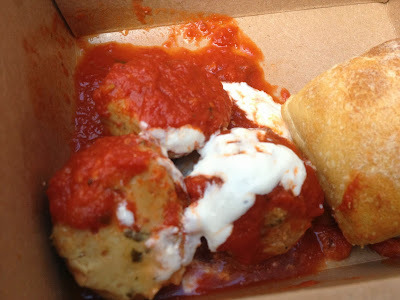 That’s MEATBALLS, folks, if you include the vowels. My pulse begins to race, and the choice is settled before I even lock my computer screen and head towards the elevators. When I meet Amanda in the lobby and tell her the plan, she practically swoons with delight. 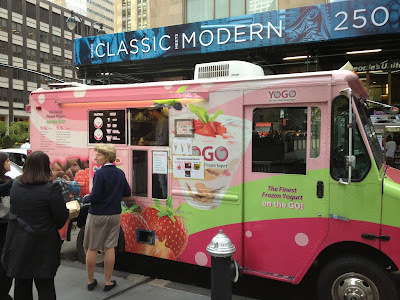 “I’m dressed very “Ladies Who Lunch,” so how exciting to be dining at a food truck,” says Amanda breezily. Indeed, the tasteful silver brooch and heels are sure to be the envy of Food Truck Alley. My food truck cronies always seem to be dressed to the nines. “This is better than lunch at Saks,” she adds. We take a brisk walk through the underground promenade in the Rockefeller Center area and emerge on 47th Street heading towards Park Avenue. This route takes us through the Diamond District and Amanda is immediately distracted. She points to a glittering “rock” in the window the size of a lollypop. “You’ll buy me one of these after lunch, won’t you?” she smiles. Not without a trip to the ATM, sweetheart. We soldier on and as we near Park Avenue, we can see a caravan of garish food trucks glittering in the distance. It’s almost like when Dorothy, the Scarecrow, Tin Man and the Lion approached the city of Oz. Our choice is either beef, chicken or veggie balls. 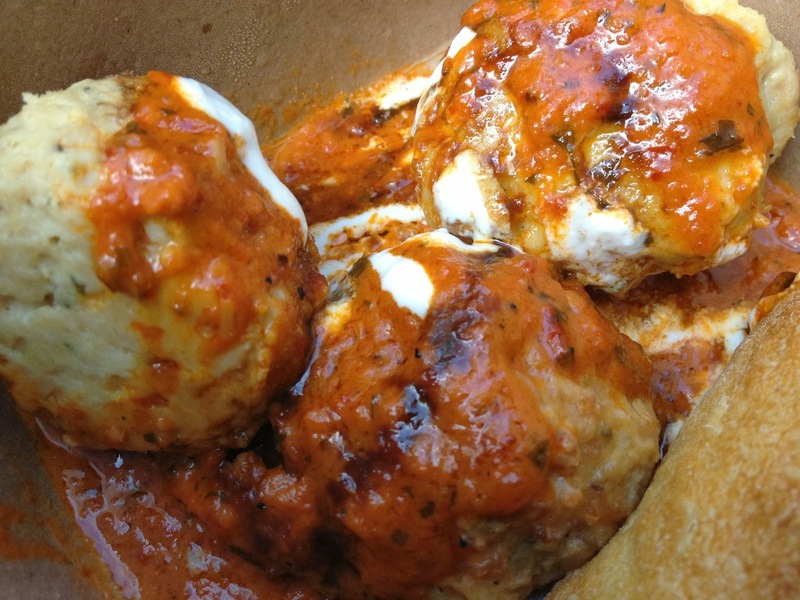 We queue up and each request a Bowl of Balls – beef please. Here’s where we hit a momentary snag. 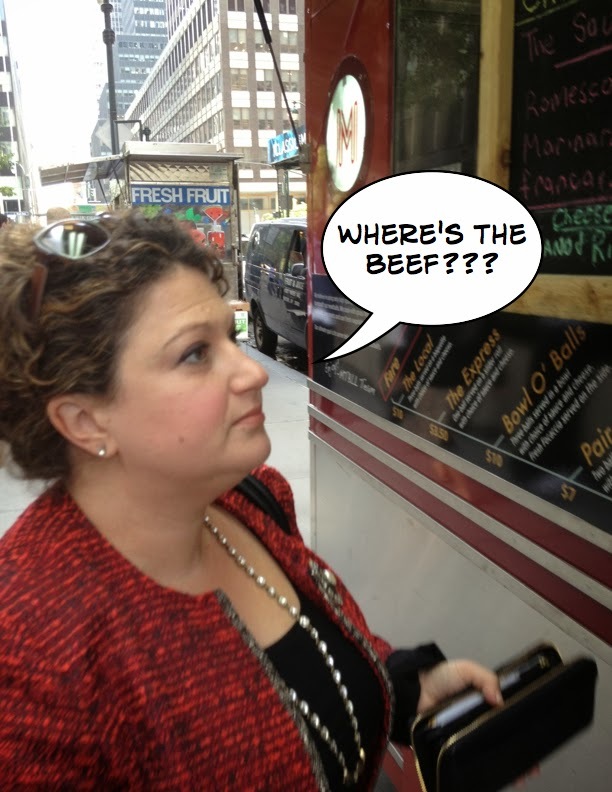 They are all out of beef meatballs. For a second I fear that Amanda is going to break ranks and defect to the Lebanese truck around the corner. “No beef? ?” she asks, her voice sounding a little pinched. So, we each order a Bowl of Chicken Balls. Hers are bathed in marinara sauce. Mine are dressed with Romesco sauce, a lively red pepper sauce from Catalonia, Spain. Each serving is topped with a dollop of ricotta. The first thing we notice is that the “bowl of balls” actually comes in a cardboard box. If you use your imagination, those sharp, angular edges suddenly become rounded. We head for the Chase Bank on the nearby corner and set up for a picnic on the outdoor plaza. I realize that it’s been some time since I’ve actually dined al fresco from a food truck. There is something to be said for noshing on ridiculously good food while you people watch and bask in the afternoon autumn sunshine. 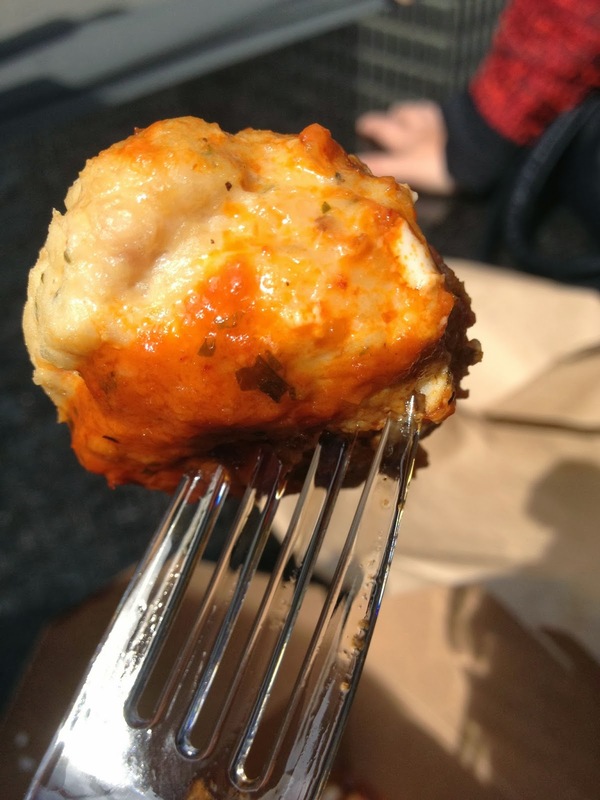 The chicken meatballs are impressive – three generous-sized balls, bigger than a golf ball, but not quite the size of a tennis ball. The marinara sauce is smooth and velvety, and the Romesco sauce has a nice, sharp kick. Amanda likes the marinara sauce, but develops some serious Romesco envy. We pronounce the balls to be brilliant. 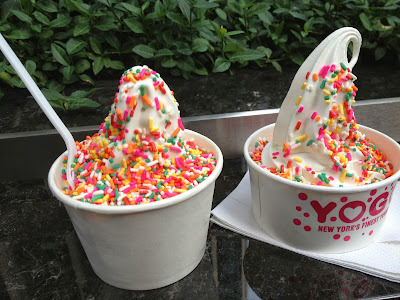 On the way back to the office, we decide to indulge in a little dessert and pick up two cups of vanilla frozen yogurt from the YOGO truck – fat free, of course, with rainbow sprinkles. I offer to treat and pick up the tab. 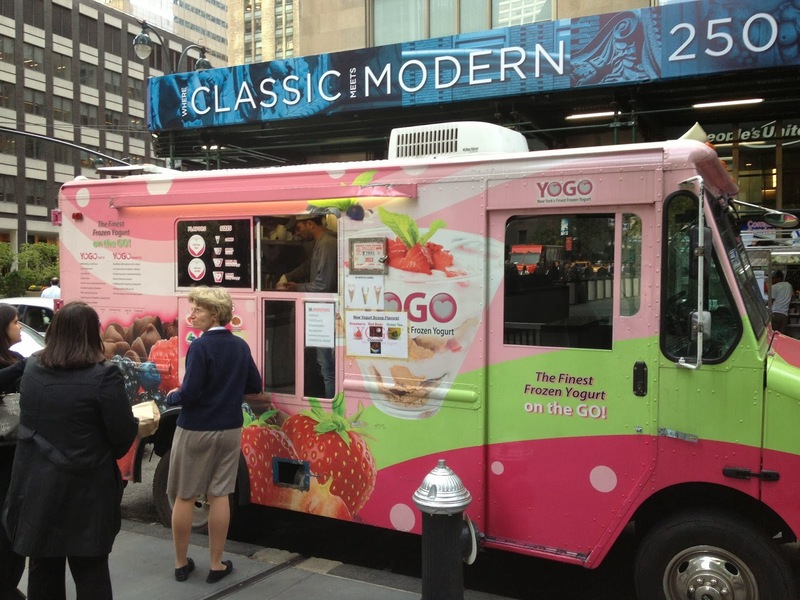 She tastes the frozen yogurt, and her tone changes. "This is delicious! It can't be fat free. Do you think it's really fat-free yogurt, or are we in that "Seinfeld" episode now?" I always have a ball with her.